Today is the fourth birthday of Postcards From the Gods. Looking at the above screen cap I notice that not a single thing I said then is still true. 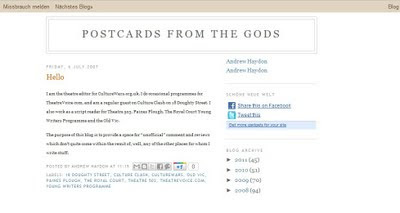 I'm no longer theatre editor for CultureWars.org.uk, I don't do occasional programmes for TheatreVoice any more, the internet channel 18 Doughty Street no longer exists, and I stopped working as a script reader a couple of months after starting this blog. Similarly, the purpose of this blog hasn't really been to 'provide a space for “unofficial” comment or reviews that don’t quite come within the remit of any of the other places for whom I write stuff' since I started posting my reviews for CultureWars here and writing blogs for the Guardian. Mercifully, a 4th birthday is hardly meant as a time for “taking stock”. I imagine by my own fourth birthday I'd learnt to talk and learnt to walk. I'm not quite sure Postcards has done quite as well, although I think it just about stands up. 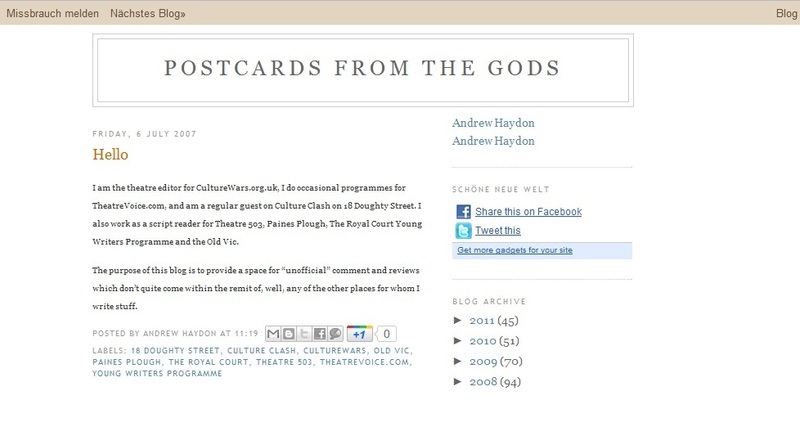 As ever, I've got a whole bunch of half-written, half-thought-through pieces sitting on my desktop – the rest of those pieces about narrative, those reviews of Die Heimkehr des Odysseus and Ghost Machine, a bunch of thoughts about the second incarnation of the theatre blogosphere – and then there's a pile more sitting in a folder called “Unsent Postcards”. If there is one thing I have learnt in the past four years, it's not to make rash promises about when, if ever, they'll see the light of day.